Private G/51727 George Franklin Brooks, 11th Battalion, Royal Fusiliers. George was born in Kintbury 1888 as George Franklin Morton, the son of Ellen Morton née Blissett the widow of George Morton. George senior earned a living as a groom, although he initially trained as a jockey, he evidently did not make the grade in that very competitive occupation. He and Ellen married in East Ilsley of 5 August 1876 and had four children: Charles (born c1879), Lizzie (c1882), Nellie (1883) and Annie (1886). In 1885, George died in Kintbury and was buried on 27 November, while Ellen was pregnant with Annie. By 1881 Ellen had evidently taken up with Edward Brooks and there is every indication that he was the father of George junior. After the two married in 1889 young George became known as George Brooks, unlike his four step-siblings who kept the Morton name. Further siblings arrived in 1891 (Jane) and 1894 (William Jonas). Edward Brooks was a farm labourer and rick thatcher, so it is perhaps surprising that he found employment in Newbury, but even in 1911 there was a farm in Speenhamland on what is now Pelican Lane. The Brooks had moved to Speenhamland by 1901 and lived in Kennet Place, a group of cottages on the north side of the London Road, at one time workers cottages for a short lived silk weaving business. By 1911 George was working as a printer’s labourer for the local paper, the Newbury Weekly News. He was still working there when war broke out in August 1914. He was not among the wave of volunteers who rushed to enlist in the early months of the war; conscription was introduced in 1916 resulting in his call to arms. On conscription he was sent to the King’s Royal Rifle Corps (where his regimental number was 30709) for training. However, he was transferred to the Royal Fusiliers and sent as a replacement to their 11th Battalion on the Western Front late in 1916. In the spring he was wounded, with shrapnel in the throat, resulting in an extended stay in hospital back in England. One he had recovered and was passed fit he returned to his unit. The regimental badge of the Royal Fusiliers, as used on CWGC headstones. In October 1917 the 11th Royal Fusiliers were in Flanders, taking part in the Allied Offensive known as the 3rd Battle of Ypres, or Passchendaele. The principal objective of the offensive when it was launched on 31 July 1917 was the capture a ridge of ground to the north-east of Ypres on top of which was the village of Passchendaele. After taking the ridge in the opening days of the campaign the British could then swing north to the port and U-boat base of Zeebrugge. There were even plans for an amphibious landing to support this thrust north. Almost three months later the Germans still held Passchedaele and all thoughts of Zeebrugge were long forgotten. However, the British had made some progress through the mud and up the slope towards Passchendaele, there were now within striking distance of the village. An attack on 12 October was called off after one day as the weather deteriorated and the mud became impassable. On 26 October they would try again led by the Canadian Corp and, finally, the village would fall to the Canadians on 6 November. TRENCHES 22/10/17 to 24/10/17 at 3am on morning of 22nd inst the Battalion moved forward from CANE TRENCH Area to PHEASANT FARM at UA – POELKAPPLE MAP, and acted as support Battalion to 10th Essex Regt – 53rd Bde who attacked the BREWERY East of POELKAPPLE. This attack was very successful – all objectives being gained and held. Battalion was called on to hold the positions taken – this operation was successfully accomplished. Casualties on 21s inst were Other Ranks 1 Killed, 4 Wounded, 1 Shell Shock. Casualties on 22nd inst were Other Ranks:- 2 Killed, 29 Wounded 14 Shell Shock and Captain A Aley wounded. Battalion held the line and late at night – from 7pm, the Battalion was relieved and proceeded to YSER CANAL at C.26.c where Busses were waiting to convey Officers and men to DIRTY BUCKET camp AT a.30.Central Sheet 28 NW Belgium. 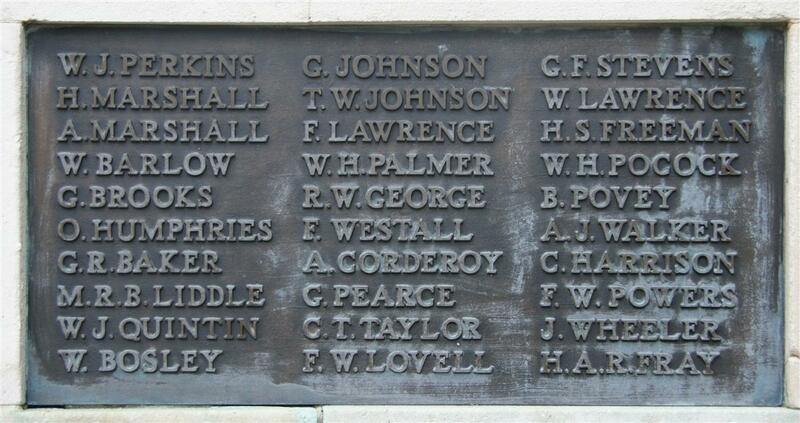 Casualties for the 23rd inst were Other Ranks:- 12 Killed 27 Wounded 2 Shell Shock. Casualties for the 2-4th inst were Other Ranks:- 1 Wounded. There is no way of being sure when George received the wound that led to his death, but the fact that his body was buried at a cemetery close to the battle area (about 3 miles away from where the action took place) suggests that he did not survive long after being wounded and that he was probably counted among the wounded during the period 21 to 23 October. Pte George Brooks, whose death is notified was an old “Newbury News” hand, having been on the machine room staff a good number of years. On being called up last year, he joined the King’s Royal Rifles but was transferred to the Royal Fusiliers, and went across the water some time before Christmas. After about four months’ fighting he was sent home again, having received a nasty shrapnel wound in the throat. Recovering from this, and being pronounced fit for general service, he again went out, and this time had only been over there about two months before he received such wounds that caused his death on October 23rd. Pte Brooks lived with his parents, Mr and Mrs E Brooks, at South View Cottages, London-road who have another son, Pte W Brooks, in the RAMC, and has been at the front for more than two years. Pte Brooks is the sixth war loss sustained by Blacket Turner and Co. He was buried in grave II.C. 23. at Minty Farm Cemetery. Locally he is remembered on Tablet 13 of the Newbury Town War Memorial and on the Speenhamland Shrine, the memorial to the casualties of the Parish of Speenhamland, previously sited in the parish church of St Mary’s in London Road it was moved to St Nicolas Church in Newbury when St Mary’s was demolished. George's brother William survived the war and returned to civilian live, dying in Curridge, near Newbury, in January 1951.